Home / GST-Tally / TallyERP.9 Lessons / How to create a sales return (Credit Note) Entry under GST Regime? 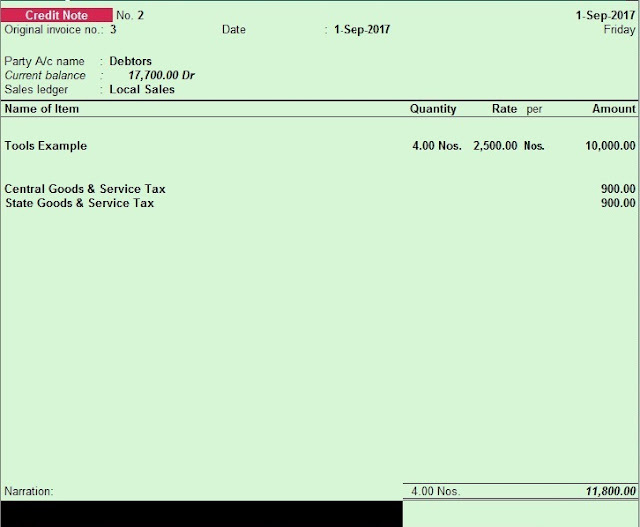 How to create a sales return (Credit Note) Entry under GST Regime? You can record sales return for (local and interstate sales) sales against an earlier sales transaction using a credit note. Your sales return will be record in Credit Note in GSTR - 1 but for Credit note you must have a valid sales record entry. Enter original invoice no. and date for which sales return has been received. Select party name for sale return. Select Tax Ledger Central Tax and State Tax. You can view the Tax Analysis by Clicking Tax Analysis on right panel or Press Alt + A. Press Enter or Ctrl + A to save the voucher. Similarly you can record sales return for Inter State Sales and Select IGST for Tax.